Everyone it seems is talking about uses for vinegar around your home, including how it can be used to clean and disinfect your home. Does vinegar kill all types of germs, and also work on all types of stains and grime? Some people say it does, but as we all know many other cleaners only work on certain types of stains and dirt, but not all, and do not kill all types of germs, so why do we seem to assume vinegar will do all these things? The science of vinegar tells us that it has certain good uses, but it can't do everything some people promise it can do. Now, don't get me wrong -- there are lots of uses for vinegar within your home that really work, and its reputation as a great natural cleaner for your home is well deserved. 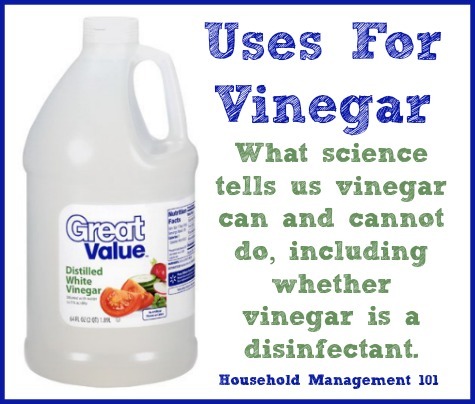 However, I want to debunk some of the claims about the uses of vinegar for cleaning that just don't hold up when you look at the science. Vinegar is an acidic liquid, because it contains acetic acid. 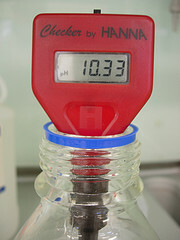 A 5% acetic acid solution, such as white vinegar, has a pH of 3.1, which is considered a moderately strong acid. Remember from school that all liquids are measured for their acidity or alkalinity based on the pH scale? Acids have low pH and alkalines have a high pH. Not only do cleaners have a low or high pH, but so do stains and dirt. Generally, you use an acidic cleaner on alkaline (also known as alkalie) dirt, and an alkaline cleaner on acidic dirt. That means one of the uses for vinegar that really works is that it is good for cleaning alkaline stains and grime. Examples of alkaline grime is hard water and mineral buildup, and also soaps and detergents. Vinegar is good at fighting soap scum because it is an acid attacking an alkalie. Another of the uses for vinegar is dissolving hard water stains and mineral deposits, which it is also good at, because it is an acid attacking an alkalie. On the other hand, there are lots of types of stains, grime and dirt that are acidic in nature. That is why soap and detergent are so good at cleaning many of them, they are mild to moderate alkalies (8.1-11 on the pH scale). Plus, soaps and detergents also contain surfactants, which mean they can also clean oily dirt well. Have you ever heard that one of the uses for vinegar is to cut grease? I know I have. In addition, vinegar does not contain surfactants, so it cannot carry oil and grease away in the same way that soaps and detergents can. Therefore, the science of cleaning says that vinegar is not good at cutting grease like some have claimed. 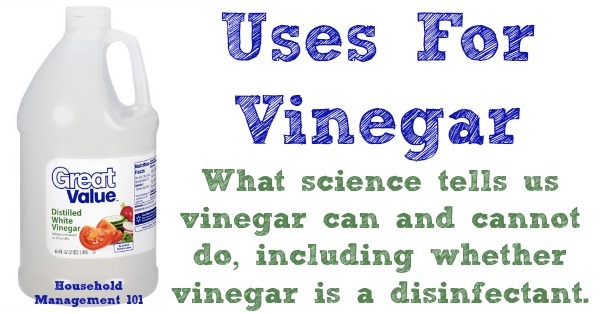 There are also a lot of claims that one of the additional uses for vinegar is to disinfect without harsh chemicals. There a lots of things out there that can kill all or some microbes (which include bacteria, viruses and fungi) to one degree or another. Besides vinegar the list includes, but is not limited to, hot water, sunlight, and chlorine bleach. However, these ways of killing microbes do not all do the job the same way or as well as some of the others. Plus, not all of these methods are "disinfecting," some are just reducing the number of live microbes. What Do The Terms Disinfect and Sanitize Mean? Cleaning just removes dirt and grime, which as a by product of that kills some microbes and flushes others away. The Environmental Protection Agency (EPA) defines "disinfecting" and "sanitizing" differently, but for our purposes they can mean the same thing, killing germs with germicial agents at near 100% effectiveness. As stated in the Slate article, Do Green Kitchen Cleaners Work?, by Nina Shen Rastogi, "their relative effectiveness will depend on a few factors  namely, the kind of organism you're trying to kill, the nature of the surface you're trying to disinfect, the duration of the application, and how much of the stuff you put on." This article cited scientific studies from 1997 and 2000 showing that vinegar (along with other natural cleaning products) did disinfect some microbes, but not all. Therefore, the article concluded, "These mixtures will probably reduce the number of bugs in your kitchen, but, again, there's no reason to believe claims that these mixtures are "just as effective as conventional" (i.e., EPA-regulated) disinfectants." The good news -- you generally don't need to sanitize and disinfect things, just clean them and reduce the number of germs down to a more reasonable level. There are, of course, exceptions to that rule for the kitchen and bathroom, but most of your house does not need to be (nor could it be) germ free. So the fact that vinegar does not disinfect, at least not to the level that is sometimes claimed, doesn't make it bad to use or ineffective. It simply means that vinegar has its uses and its limitations, like anything else. However, there are still plenty of uses for vinegar around your home. I just want you to take all the claims made about vinegar with a grain of salt, apply what you know about the science of vinegar, and decide for yourself whether the claim is accurate or not. Many claims are accurate, some are not.